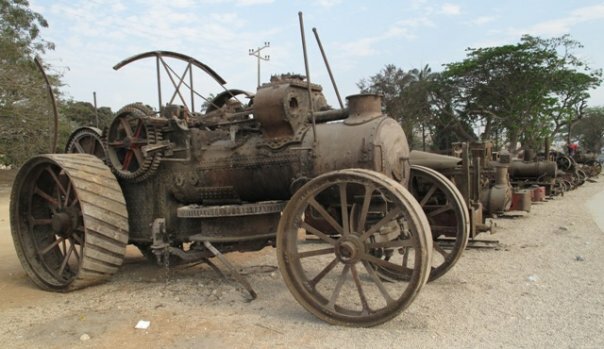 About a year ago I wrote a post about several abandoned ploughing engines in Angola which I had become very interested in. In the intervening period I have spoken to several people who have seen these engines first hand and even heard of several reports that the engines had been moved or tipped over. It is difficult to make out the other items in the shot but I know on the site there are 2 ploughing engines (not a pair), a couple of implements, a portable engine and a very early Lanz tractor. I understand the line of machinery above has now been moved to make way for a new bridge. A number of parties are trying to get these engines out of Angola to be restored, it remains to be seen if they will ever make it out of the country. This entry was written by David Collidge, posted on 2 March 2010 at 9:14 pm.